Lots of tiny snowflakes for some kind of winter/holiday use. The snowflake designs are from a vector-graphics snowflake patterns file on Zezu. In future days we will make these larger and add holes/hooks so they can be used as ornaments. 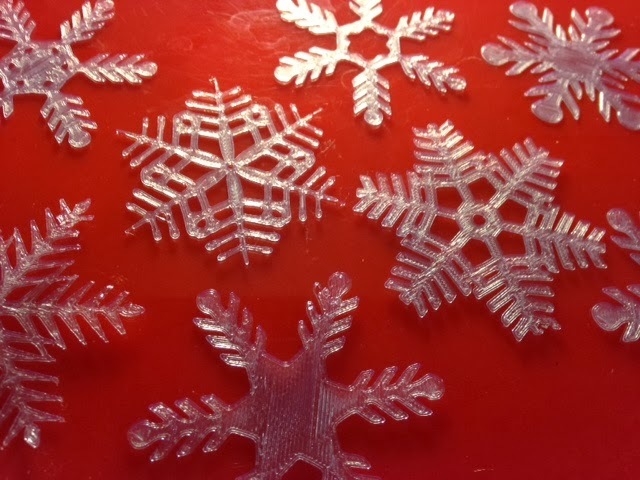 Settings: MakerWare low/.3mm makes these one layer thick, which makes printing very fast (about 3 minutes per snowflake). Technical notes: Today's print is a simple example showing how to import a picture you find online into Tinkercad, via Inkscape. Tinkercad can import .svg graphics files, but those can be hard to find - and even when you do find them, sometimes Tinkercad does not import them well (for example filling in concave areas). The method below doesn't always work for every type of picture, so if you have trouble getting it to work you might try starting over with a different source image. 1. Find a graphic that you wish to use. Many formats will work; in this example the file started out as a .jpg. If you can find an .svg file you might be able to jump right to step 6 below. If doing that doesn't seem to work then come back here and do the rest of the steps. 2. Open the graphic in Inkscape. 3. Select the graphic with the arrow tool. 4. From the "Path" menu, choose "Trace Bitmap". There are some options you can set, but if your image is relatively simple with sharp lines, you should be able to leave the options as they are. In this example we also checked "Invert Image" so that the white snowflakes would get traced out as the main objects. In general, try it without this checked and if you get the negative of what you want, then go back and invert the image and try again. Click "OK" and then close the "Trace Bitmap" window. 5. From the "File" menu, choose "Save As", and from the list of filetype choices in the lower right of that window, select "Plain SVG". Be sure to change the extension of your filename to .svg, and to note where the file is being saved on your computer, before clicking "Save". 6. From within Tinkercad, open the "Import" tab in the right margin and select your .svg file. It is usually a good idea to import at 30% of the size, since otherwise the image will be gigantic. Click "Import" and then be patient; it can take some time for the file to import, and it may look like a tiny speck for a minute as it finishes loading. 7. You can now use this image however you like in your Tinkercad designs! Be sure to credit the source of the picture when posting online about your object or describing your work.